Mix all ingredients and let sit for five minutes. Add more coconut milk if you find batter is too thick. Add coconut oil or butter to a pan and heat over medium heat. 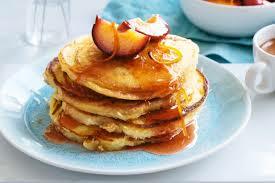 Pour about 1 cup of batter for each pancake, allowing each side to brown before flipping it. Serves 2-4. If you want some healthy and delicious additions to your pancakes, add a few blueberries, bananas, crushed pecans, or walnut pieces immediately after pouring the batter in the pan. Instead of using all coconut flour, you can also experiment with using half coconut flour and half almond flour, which, in my opinion, makes a very balanced flavor.